SCVHistory.com DC2207a | Harry Carey Jr. Collection | Actors Harry & Olive Carey at Home in Saugus. Actors Harry and Olive Carey at home on their ranch at the mouth of San Francisquito Canyon, just north of today's Copper Hill Drive. Their two children would be born in this house — Harry Carey Jr. (Dobe) in 1921 and Ella (Cappy) Carey in 1923. This house survived the flood that resulted from the collapse of the St. Francis Dam in 1928, only to burn down in 1932. 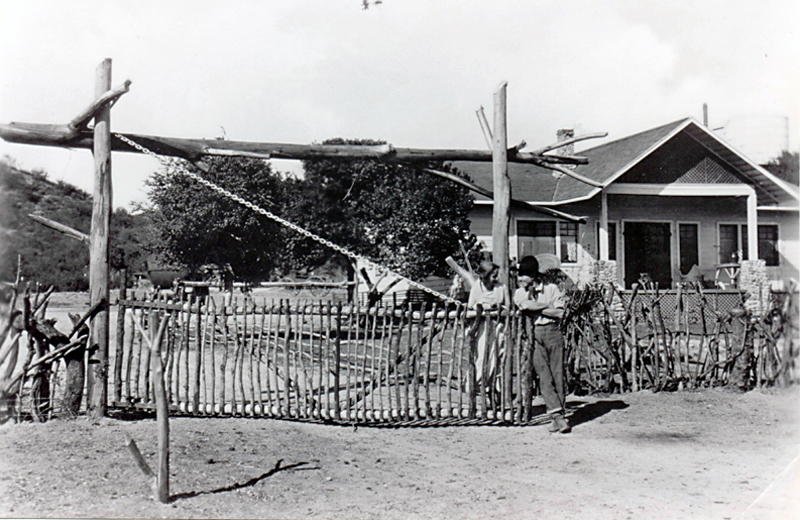 The Careys replaced the house with an adobe ranch-style home which today is the centerpiece of the Tesoro Adobe Historic Park in the Tesoro Del Valle subdivision. DC2207a: 9600 dpi jpeg from original print courtesy of Harry Carey Jr.